ETA: Voting is now open through October 30th, 12pm EST. Check out the fabulously funky five finalists & vote now! 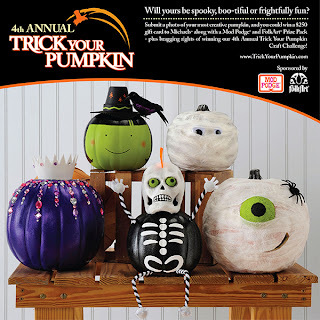 One of our fall event sponsors, Plaid Crafts﻿, is hosting the 4th Annual Trick Your Pumpkin Contest! Will yours be spooky, boo-tiful or frightfully fun? Submit a photo of your most creative pumpkin by October 25, 2013, and you could win a $250 gift card to Michaels along with a Mod Podge and FolkArt Prize Pack, and bragging rights of winning the 4th Annual Trick Your Pumpkin Contest! Find all the details on this page of their website. Receive $10 off your $45 purchase with the following promo code: 1045SEP13. Shop here!